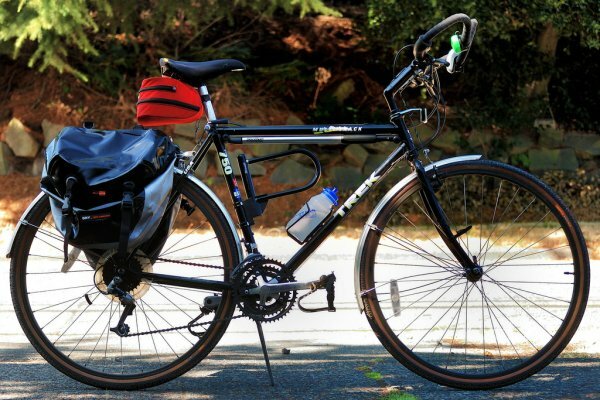 10 Long-Distance Bicycle Routes in the U.S.
From Denali to Miami, America offers up routes that can make for weeks- or even months-long bicycle getaways. It doesn’t get much bigger than this. The TransAmerica was inaugurated during the 1976 “Bikecentennial,” a bicycle-based celebration of America’s 200th Independence Day. The route runs 4,262 miles from Virginia’s Atlantic coast, through the heartland of the USA, over the Rockies, and terminates at the Pacific in Oregon. It was the success of the Bikecentennial that strengthened the popularity of cycle touring and led to the creation of many more American trails, some of which are profiled below. Delivering what it promises, the Pacific Coast Route takes you from Washington’s border with Canada all the way down to San Diego, hugging the water practically the whole way. 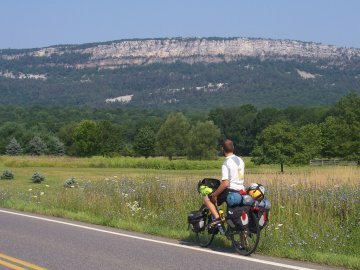 Much of the 1,853-mile route is on shared roads, though there are some bicycle-dedicated stretches. Services — including top-notch campgrounds — are never far away. For the super determined, the route can be extended beyond U.S. borders: north into British Columbia and south into Mexico…and beyond. Though currently only 23% complete, the East Coast Greenway will one day link Calais, Maine, and Key West, Florida, with a 3,000-mile, firm-surface, non-motorized trail system. If you want to help the Greenway folks get this done just a little bit quicker, check out the details on their Close the Gaps Campaign. The route is definitely ridable today, with the remaining 77% comprised of low-traffic roads. Challenge-seekers, this one’s for you. I’ll throw out some stats to get the blood pumping: 2,493 miles long. Mixes gravel, single-track, and converted railroad beds. Crosses the Continental Divide 50+ times. Gains more than 200,000 feet of elevation! People who’ve ridden this trail laugh when they hear others say the Tour de France is tough. The record time for cycling the whole thing? 15 days. Get to know America’s Big River by cycling its length. The Mississippi River Trail follows it for 2,000 miles from its source in Minnesota, down through steamboat country, to the delta in New Orleans. 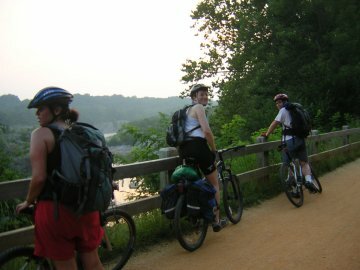 The trail includes bike-friendly roads as well as off-road paths and winds through 10 states. The escape of Southern slaves to the freedom of the North is one of the most tragic and heroic stories in American history. With the newly unveiled Underground Railroad Trail, you can see firsthand the routes that were taken by these fugitives. Only, picture yourself traveling at night. Pursued. Oh yeah, and on foot. For more info on the 2,028-mile trail, check out the four-part documentary playing on Adventure Cycling Association’s YouTube channel. These were the explorers charged with mapping the land acquired in Jefferson’s Louisiana Purchase, and this route traces their journey through the Great Plains and into the Pacific Northwest. Of course, the original voyage was made largely by boat on the Missouri and Columbia Rivers, so the bike route follows the water whenever possible. It extends for 3,252 miles on a mix of paved roads and multi-use trails and gives easy access to many museums dedicated to the Lewis & Clark expedition. Though created and maintained as two separate paths, these non-motorized trails link up to connect Washington, D.C. and Pittsburgh, PA, running a total of 330 miles. Cycling the two takes a few days and is popular in autumn, when the leaves turn. The C&O Towpath is the same one that was used to drag boats along the old Chesapeake and Ohio Canal until the waterway’s closure in 1924. Its route is now preserved as a park. In Cumberland, MD, the Great Allegheny Passage takes over. The rail trail has yet to be extended into Pittsburgh proper, but work is underway to complete this last phase of construction. 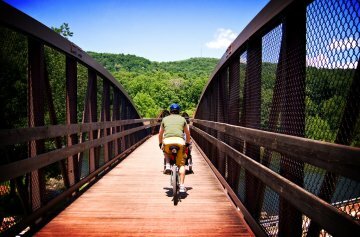 If you’re not up for driving the Green Mountain State, why not cycle it? The 376-mile Green Mountains Loop starts and ends in Burlington and threads through the small New England towns and forests that make VT so special. Most of the route is on shoulder-less roads, though traffic is generally light. While you won’t actually be climbing any mountains, expect hills. The Denali Highway was once a supply route for miners during Alaska’s Gold Rush, and later the main road for visitors to Denali National Park. 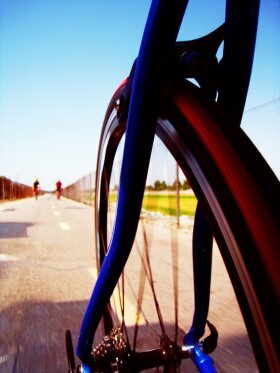 Those days are over, and now the highway is a prime destination for cyclers. Though a fairly short ride at just 133 miles, there are plenty of opportunities for off-the-saddle exploration — you don’t have to look far to find a chance to hike, paddle, or camp. The highway runs from Paxson to Cantwell and is mostly gravel. A map showing several of these routes and many more is provided by the Adventure Cycling Association.